From the widespread introduction of modems in the early 1980’s, access for employees to corporate data has always been on the agenda. With the advent of broadband many businesses, from the very small to the very large, have adopted some form of remote access. The form this access takes can vary considerably. Smaller companies often use ad-hoc connections like Microsoft Remote Desktop Protocol (RDP) or some form of desktop sharing service like LogMeIn. If you’re looking for the Best Way to Ensure 24/7 Access to Your Businesses Data, then following Comparison of VPN Hosting and Cloud Storage Features Review will helps you to make the right choice. As companies get larger, and internet speeds and technologies get more advanced, they typically face a fork in the road; VPN or Cloud. On the face of it this seems a stark choice but in reality this question can be more simply distilled; your cloud or mine? Arguably, VPN access to your company for private IT resources is simply your own cloud. The question is then, do you outsource that requirement? With many large cloud providers offering access via VPN, the fact you get end-to-end encryption to your data is a given; regardless of if you use VPN or cloud. Where the security element becomes important is when you consider who is controlling that VPN. Is it IPSEC or SSL? Is the cloud providers backend software secure? What are the connection parameters? What if the cloud company pulls the plug of VPN access to your data? The only way to have full control over the secure access to your data is to retain a VPN system of your own. Smaller companies may be comfortable knowing that their connection to Google Drive or Dropbox is a signed SSL connection. It’s unlikely that a large company will share this ethos however. Once a VPN is involved there will be some form of mandatory sign in procedure. Depending on the security required this may also involve some form of two factor authentication. Accessing your data from a hotel or airport may prove to be where the issues start. Once on a public connection you’ve got no way of guaranteeing that they will allow your specific type of VPN connection. There are ways around this, but they may add complexity to the situation. If staff cannot access your premises, can they still access your data? It depends of the nature of the outage. In the event of heavy snow or flooding a good quality Virtual Private Network might very well save the day and allow staff to work from home. If your business premises are totally shut down by some form of outage then the opposite will be true – you won’t be able to operate. This is traditionally one of the big selling points of the cloud; the idea of 100% uptime. As the Amazon Cloud failures of 2011 and 2013 showed us though, even cloud networks can go down without warning. Once again the “control” element raises its head. 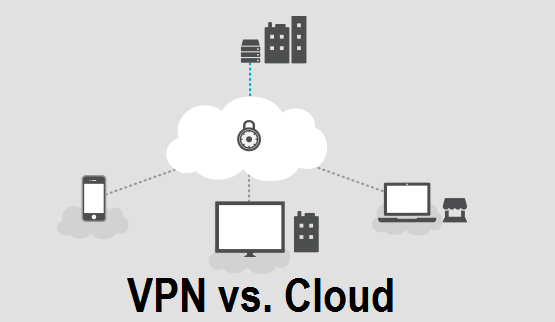 Go Cloud and you are likely to see some savings over a similar internal VPN solution but, as time goes by, cloud costs can quickly escalate as your needs do the same. While a VPN solution will have similar costs of escalation, you are far better placed to be able to control them. If you work in the financial sector you may already know that data security is viewed as very important. If your industry sector is held to standards over data security, neither a VPN or cloud solution will prove to be a magic bullet. A badly configured VPN can cause just as much risk as a cloud service security hole. If you run a VPN then expect to have to spend time and money updating and upgrading software and hardware to keep security tight. As you may have already concluded by now, there is no one-size-fits-all answer to this question. The amount of data, your technical requirements and the needs of your staff will all impact on the decision hugely. However, if in-house control is key to your business then a VPN will provide you with far more customisation and control than a cloud provider. You can expect to fork out a larger initial cost for choosing to go with a VPN, although this should even out with comparable cloud solutions as your requirements and business grows. You can also refer to British Unified Communications service provider, Solution IP.